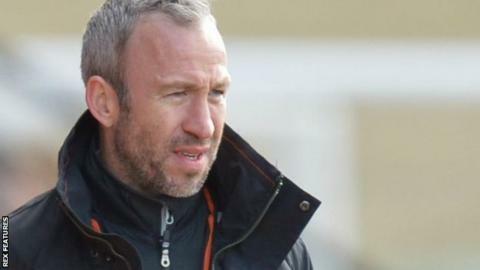 Cambridge boss Shaun Derry wants "at least a point" at Accrington to keep their play-off hopes alive. The U's travel to fourth-placed Stanley on Saturday with an outside chance of promotion themselves, sitting six points off the top seven in League Two. "Every game we play gives us a chance to still be in it the following week," Derry told BBC Radio Cambridgeshire. "I want to have a conversation with you again next week that suggests we're still in it." Derry's first home game as Cambridge manager came against Stanley in November and the U's boss is full of praise for John Coleman and his team, who are a point from an automatic promotion spot. "Along with (Northampton boss) Chris Wilder, I'd probably say John Coleman has been the standout manager of the year at our level," said Derry. "They've kept their performance levels high. We, on the other hand, have dipped at a critical time." While Accrington are undefeated in five league games, Cambridge have won only one of their last five fixtures. "I suppose that's where we are at the moment," Derry continued. "We are that team in transition, so we don't get too down with the losses but at the same time we don't get too upbeat with the wins either."